Do you give these excuses? 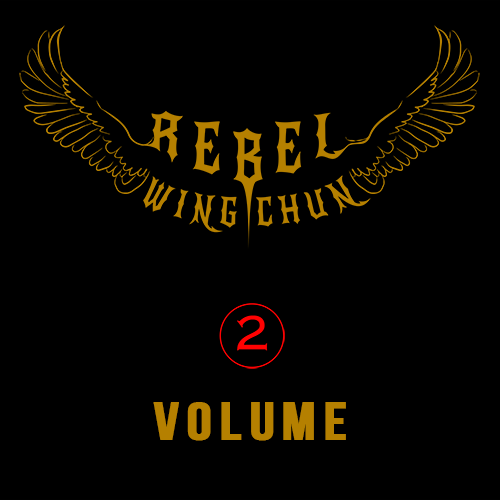 Rebel Wing Chun was developed to get away from all the purists who wish to dead-end the true benefits of Wing Chun. Those who wish to keep it in a state that can’t adapt to the rigors of attacks from grapplers, multiple opponents—at the same time—or weapons attacks. We also deal with effectively getting into range from fighters skilled in the kicking range. This isn’t your traditional Wing Chun. This is not your traditional Wing Chun—for a reason: The traditional Wing Chun mindset is mired in ego and elitism, while lacking function in any range except the trapping range against other Wing Chun practitioners or the untrained individual. 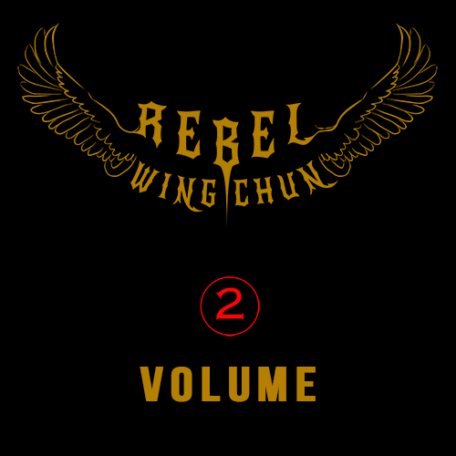 Rebel Wing Chun was formed to demonstrate an effectiveness using true Wing Chun functionality—the “essence” that makes Wing Chun so valuable—in ANY range where contact is established. Effective training that gets to the heart of the training as early as possible. Your time is valuable, so is mine. I don’t waste screen time talking about what I’m going to show you—I just get right in and show you. Volume 2 covers the elbow strikes used in RWC, including the sneak elbow that is so devastatingly functional. Hatchet kicks are shown in detail with their ability to severely damage an attacker’s knees and their ability to continue attacks. Energy sensing drills, pinpoint sparring and energy sensitivity training round out the education. 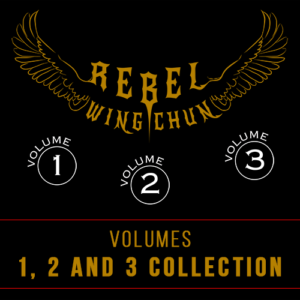 The Training Reading Incoming Strikes video demonstrates Rebel Wing Chun (and Core JKD’s) extremely functional peripheral training for reading incoming strikes. More videos will be uploaded as available in this volume without charge. This Conditioning video is filled with 120 minutes of conditioning exercises that we use in Core JKD as a foundation to keep us in fight shape! If so, then this training video is for you. Every Striking Tool Technique In One Place. Have you always wanted to know just how to use that Inverted Hook Kick? 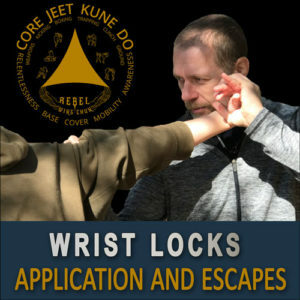 Or maybe you want to know what the heck that Core JKD Corkscrew kick or Corkscrew Punch is all about? 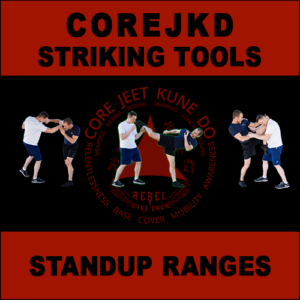 The Core JKD Standard reference videos are a virtual encyclopedia for the following range tools: Kicking, Boxing, and Clinch. Each video details the specific tool mechanics for their range and how to use them efficiently. 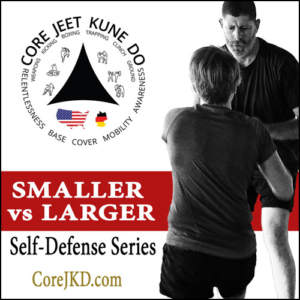 The Smaller Person vs Larger Attacker Self-Defense Videos cover some of the most effective—and Core JKD Original—methods for dealing with attacks coming from a larger or stronger attacker. 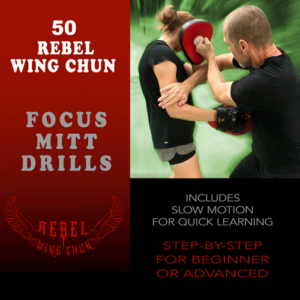 The Rebel Wing Chun Focus Mitt Drills video has got you covered. From my advanced Rebel Wing Chun self-defense methodology, I created this video for those people needing to incorporate functional self-defense pad drills that actually improve your ability to defend yourself. and more, including several front attack escapes and controls. 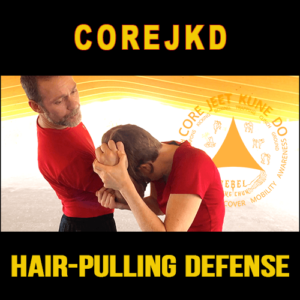 This video set shows you exactly how to defend yourself when someone grabs your hair to control you in a fight – Standup or on the Ground! This is one of the most advanced—real-world—Wing Chun systems for self-defense with aggressive opponents in all the ranges, skilled and unskilled. We give you techniques, show you how to build the skills, condition your body, enhance your periphery read and energy sensitivity read in all ranges from kicking down to the ground.